Hi i bought the flsun 3d printer i assembled it correctly and it was printing OK then i did some tweaking in slicer to try and get some better print and now the x axis always does a grinding noise when it's homing the noise always begins on the right side next to the Z motor and once it's done printing it moves back to the same right side and does the grinding noise again looking for some help to get this issue fix please. check your endstops are still connected. Sometimes the two wires soldered to the stop itself come loose. Also check you haven't changed the bed size in the slicer. The endstop is still connected to the X axis no wires broke off or came loose the problem i believe is absolutely with the slicer because it was in the slicer that i made some changes and that's when the grinding started happening, where in the slicer can i change the bed size? And i also try the Arduino software but i don't know what exactly to look for in the software to change the bed size. what slicer are you using. And what changes did you make in it ? Also just because you did something before a problem started - doesn't necessarily make them connected. I'm using Repetier host and i was able to solve my X axis grinding issue by changing the bed size in the Repetier host software. Now the issue i'm having is the nozzel goes all the way down touching the print bed the light on the sensor usually lights up before it touches the print bed now it just goes straight to the print bed kissing it, doesn't comes back up to level it self like it's suppose to i set the nozzel to -1.2 using the Arduino software but the 3d printer ignores the setting that say #define Z_PROBE_OFFSET_FROM_EXTRUDER. sounds like the probe isn't working. what sort of probe is it ? what model is your printer - just had a good look at the picture. Nor sure if it's the angle it was taken at or what. But that's one weird looking machine. Ah ha - 3d z ormerod. This is a better picture ! Last edited by curious aardvark; 10-17-2018 at 05:44 AM. 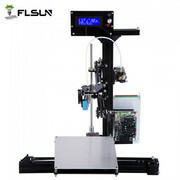 I purchase this 3D printer because it's not a big box like the other 3D printers that takes up so much space i believe the concept they use to make this 3D printer came from looking at the Y Z and X axis, you know the little green blue and red icon that be on inventer software's. This is the probe and the sensor on the X axis facing up before it goes on to be assemble facing down on the user manual. Might just have died. But double check the wiring first. Thanks but it's not the wiring the way my 3d printer is setup is i don't have a Z endstop switch i have the sensor in place of where the Z endstop switch is suppose to be plugged in because the manual say i can do so, but anyway back to the issue i was having where it doesn't come back up to auto level what i did was i change #define INVERT_Z_DIR to true now it's working like a charm again. If you are a person who gets upset easily when working on things do not buy a 3d printer because you might throw it out of a window or or throw it at your flat screen tv, WOW finally it's working like it should again, WOW.